What are your window replacement needs--a dramatic new look, an authentic replication, greater energy efficiency, a low maintenance exterior? Marvin has the replacement window options, sizes and custom solutions needed to turn your remodeling and window replacement dreams into reality. Our Process - Whether you need a few windows for a remodeling project or replacement windows and doors for the whole house, we make the process enjoyable. An expert from the Marvin Window and Door Store will come measure and decide what best suits your home and your budget. No high pressure sale in your home! We will handle as little or as much of the buying, installing and prefinishing your new windows and doors as you desire. Window and Door Installation - Factory trained professionals install your new windows and doors. They provide prompt, clean and professional service. 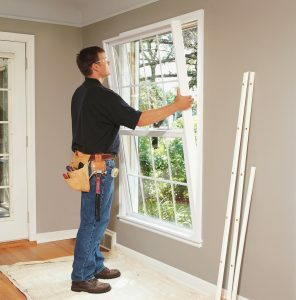 Our expert carpenters will install your windows and doors to perfectly accent your living space. Warranty - 20 year glass/10 year product - No proration, bumper to bumper. Transferable to anyone owning the residence. Finishing Services - We have the ability to prefinish the interior of your windows and doors before they are installed. This finish allows us to paint or stain the product in a controlled environment, giving you a far superior finish without the smell and mess in your home. Ask one of our salesmen about prefinishing today. Financing Your Windows and Doors - Financing options with approved credit are available with any order of $500.00 or more. Please ask about our financing promotions today. Dare to dream about the possibilities for your home! When you're done viewing these online photos, be sure to come by our store at 13819 Industrial Road in Omaha. Tell our experts about your vision for your home and learn how The Window & Door Store can help you achieve your goals. Check out our Bargain Barn photos then contact a representative to get details.